The massive pasting at 100 Franklin St. is a historic photo of children immigrants at Ellis Island. TRIBECA — A piece of Ellis Island history has landed in TriBeCa. 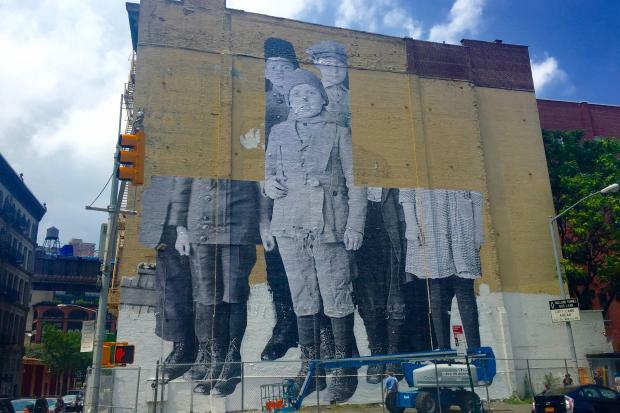 French street artist JR is in the midst of plastering a massive mural, a recreation of early 1900s archival photo of children waylaid at Ellis Island, on the side of 100 Franklin St. The photo is an homage to JR's recent photo installation and film about Ellis Island, the storied entryway into the U.S. for scores of immigrants. The artist pasted dozens of archival images inside a now abandoned hospital on the island last year. The haunting imagery became the background for his 15 minute film, starring Robert De Niro, called "Ellis." The pair — De Niro and JR — were at 100 Franklin St., sharing a bike, Thursday. The reuse of the Ellis Island imagery is a way to bring attention to the world's current refugee crisis, JR has said. “Talking about the past is the best way to understand the present and to approach our future,” JR told the New Yorker last year in an interview. JR, who previously pasted a giant ballerina photo on the same wall, is known for his large-scale installation and giant photo plasters.